I was an undergraduate when I began studying medieval France. I re-read the Romances of the 12th century, re-encountering Merlin and Gawain and Arthur - the Court I had escaped to as a child. But the 12th century was much more complex than that: Greek learning was slowly arriving in France from Al-Andalus - Arab Spain - preserved by the same intellectual adventurers who invented Al-jibra and practiced Al-kimia. How my 1960s rebel soul adored the fact that the Renaissance did not spring sudden and full-blown out of the “Western mind”! But the center of the French world was still the Cathedral of Chartres and its School - a center for the New Learning. 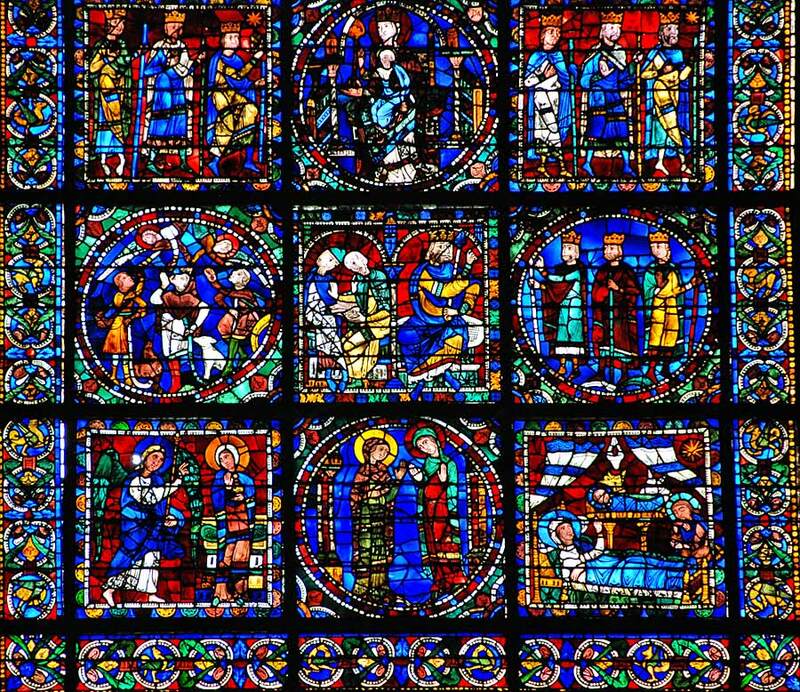 Chartres had been such a powerful illuminator. At the beginning of the twelfth century, the literacy rate was .05% Books were still primarily manuscripts copied by monks, and rare as the jewels in the crown of a countess. The sculpture and stained glass of the Gothic cathedrals introduced all the characters, all the stories, the Church wanted to tell. Even Aristotle, the Greek liberal arts, and the signs of the zodiac were displayed. On Christmas Eve this year, Bill and I went to the new Oakland Cathedral of Christ the Light for the musical offering that precedes Midnight Mass. Outside the cathedral is something the 12th century Church would never have acknowledged or created: A Garden of Healing for those who have suffered priestly abuse. I imagined a new age of pilgrimage to that garden. But as I stood outside the cathedral, I had the same thought I had visiting Chartres decades earlier: What if the extraordinary expense had gone to the poor? The latest technology was developed for Gothic cathedrals: the pointed arch, the cross-ribbed vault, the flying buttress, stained glass. Christ the Light also uses the latest technology. 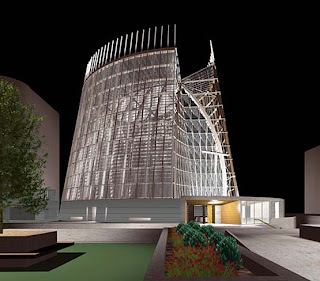 The previous cathedral was destroyed by the earthquake of 1989, so this building is protected by “a steel friction pendulum seismic base-isolation system”. What does that mean? I find the rest of the specs equally confounding. I do learn that the mathematics and geometry of the intersecting circles that form The Fish, the symbolic shape of the building, are based on the first numbers of the Fibonacci series - the square roots of 2, 3, and 5. These are the square roots of nature, of the universe. That I can understand. There is no Royal Portal, no exterior sculpture on the facade of Christ the Light. 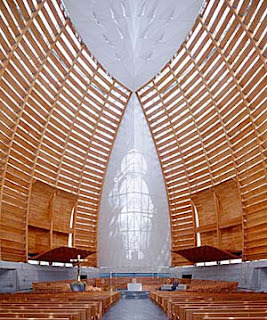 You enter into a low space centered by a baptismal font, and then you continue into the nave and the Great Soaring, and in front of you, rising 55 feet, is the image in light of the figure of Christ from the Royal Portal of Chartres. The towering walls are unadorned wooden slats that modulate light. Light! Above is the oculus, another source of illumination. The only color is found in a few paintings in the side chapels of the Reliquary Wall that supports the Soaring. And yet, both of us, non-Catholics, experienced the awe that transcends mere amazement at the new. Cathedrals were always created as a means to draw people in. They are a spiritual seduction, appealing to the senses. 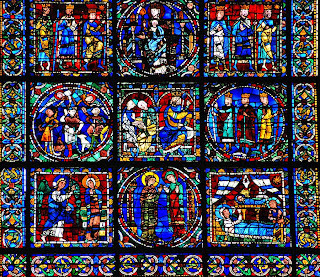 The Cathedral of Chartres was loaded with visual information in the absence of literacy and general knowledge. We are overloaded with information, our “sin” may be the continual craving for it, so the new Cathedral is quiescent. It offers rest and relief, not stimulation. It is a meditation, offering solace, spiritual renewal and respite from the secular world. 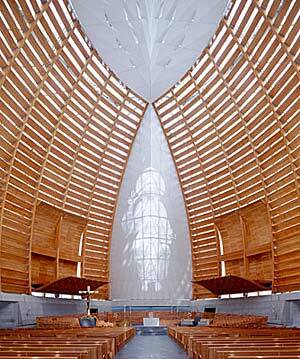 A Cathedral for the 21st century.